Since this blog is not just about health, fitness, my random musings, but also learning how to reduce stress and anxiety. This past week I decided to finally take a formal yoga class. I've been on a yoga hiatus for 6 months? maybe longer. With moving from the studio I usually went to, along with a tighter budget not being able to afford a yoga studio and gym membership, I stopped practicing. Then, perhaps as a sign, I received an email with a coupon for a free class at my old yoga studio since it was my anniversary from first going there. I went to a power vinyasa class which focuses on vigorous flows of movements in a hot room. It always is hard coming back after a hiatus because it takes me longer to get into my happy space when I'm anxious about how much yoga strength I've lost and poses that are more challenging than they used to be. Still could get into a crows pose and full wheel so booyah :) Those last minutes of savasana are worth the whole class. I'm so zoned out in the pose and finally have quieted my mind just laying there. Something else relaxing is a bit more indulgent and less healthy, but totally necessary after a day like today. Stayed late at work, didn't really get to eat lunch, and had to walk home in the pouring rain to boot. So I pulled out a Justin's Nut Butter Dark Chocolate Peanut Butter Cup pack I impulsively picked up at Target last week. Yes it's candy, but at least it's organic and GMO free. This is week two of actual meal planning in 2013, since planning actually does help out a lot during the week. I can go to the grocery store on Sundays with meals already planned out and then when I'm tired after work, I already have something prepared or ready to go. It's also great because I make more than two servings for my boyfriend and I and then we both have leftovers for lunches! Tonight I tried a recipe out of the January 2013 issue of Fitness Magazine. It was SO DELICIOUS that I had to share it with you all (or whoever reads this thing!). I had bought a red cabbage for another recipe so all I had to pick up was some salmon at Whole Foods. It was a super easy and quick dish that I whipped up after work. The cabbage mixed with the maple syrup and balsamic vinegar takes on a sweet and tangy flavor and the salmon came out really moist. I just copied the recipe from the magazine below. Let me know how you like it if you try it out! 1. Heat 2 tsp oil in a large nonstick skillet over medium heat. Add onion and rosemary; sauté 6 minutes or until onion is browned. Add cabbage and cook until softened, about 10 minutes. Stir in vinegar, maple syrup, salt and pepper. Remove from heat and cover.2. Heat a medium nonstick skillet over medium heat. Rub top of salmon with remaining oil and place in skillet, skin side down. Cook 6 minutes; flip and cook 2 more minutes or until just opaque. Remove from heat and let cool slightly. Pull off skin and cut into four pieces. 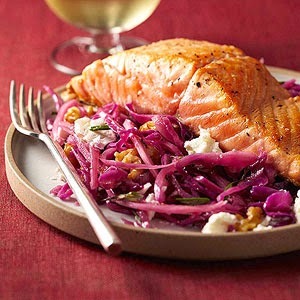 Serve slaw topped with walnuts, feta and salmon. On Sunday, it was a day of football to watch my current hometown team, the Baltimore Ravens (who are going to the Superbowl, by the way!!!!) play in the AFC championship game against the Patriots. I was hosting some people at my apartment for dinner and snacks so I decided to make a coconut curry and brown rice dish as the main course. I also made a kale salad and baked buffalo wings. 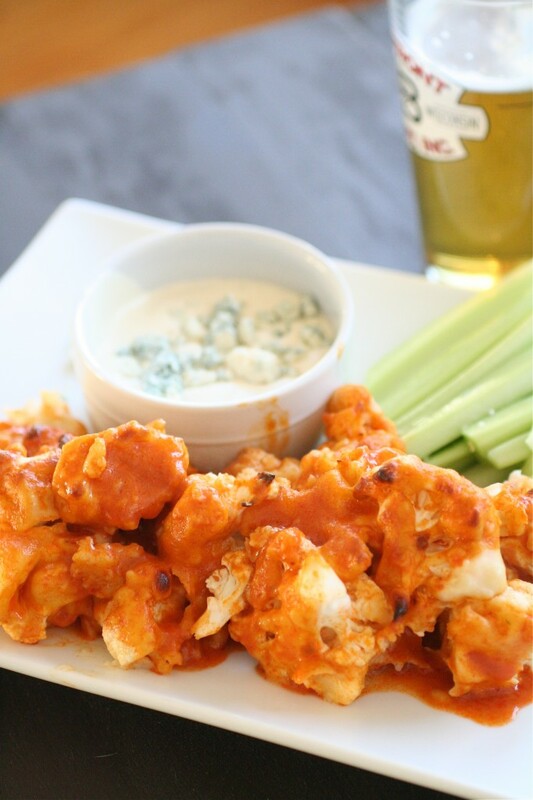 Since I wasn't trying to eat a lot of wings, I tried out a recipe I'd seen floating around on Pinterest for Buffalo "Chicken" Vegetarian Style. They are breaded in flour (I used half almond meal, half flour since I was running low on whole wheat flour!) which makes them taste more like breaded wings after being baked. The wings ended up being so yummy that even the guests eating real chicken wings liked them! I had also received the Practical Paleo cookbook for Christmas since I dabbled in paleo eats prior to the holidays and discovered that it helped with my stomach problems. 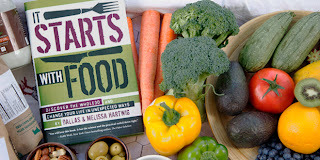 I love many of the recipes in it and all of the gorgeous photos of food. To make a clean(er) dessert for the game to go with the homemade berry ice cream my boyfriend made in our new ice cream maker (also a Christmas gift! ), I decided to try out these bacon mocha maple brownies. I mean c'mon, who doesn't like bacon and chocolate. The brownies are flourless so they came out really moist, but they were so fabulous that I didn't have any leftovers to nibble on the next day! You can purchase the book at any major book retailer or see it here on Amazon. Let me know if you try any of these recipes out or have any that you are loving lately! 1. OBSESSED with finalizing the majority of my race calendar. Kinda want to do another half before the NWM Half in DC at the end of April. Full marathon is ON for the fall even though I'm super scared. 2. I'm a lady, and I'm shoe obsessed. Not just pretty heels anymore, but it extends to running shoes. 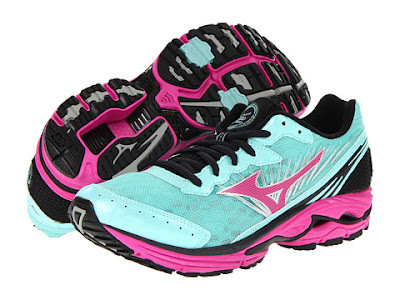 I've only run in Brooks but am looking at trying a pair of Mizunos and am in love with the colors of these Wave Rider 16s. Maybe I'll wait for a sale. Maybe. 3. FINALLY on my last Target excursion I found new Chobani Yogurt Bites. They only had a couple packages of this flavor left! Chobani Bites have 100 calories and make the perfect quick snack. I love the coffee flavor and can't wait to try the other flavors. Keep an eye out for these guys! 4. Lately I've also been craving anything coconut. I roast vegetables in coconut oil and the other night made some honey coconut shrimp which were delish! 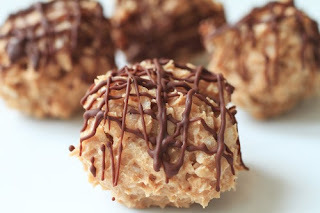 I think when I get home today I'm going to whip up a batch of these protein bites and try not to eat the whole batch! Quest Bars Are All the Rage! 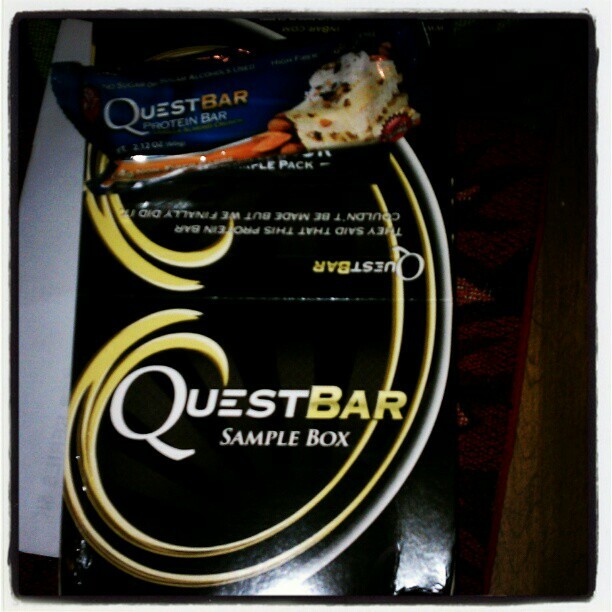 Disclosure: I received a sampler pack for review purposes from Quest Nutrition. As always, all opinions and thoughts are my own. If you follow healthy living/fitness twitter accounts, blogs, or Instagram accounts I'm sure you've heard about Questbars. They are all the rage because they are protein bars that have simple ingredients, actually taste good, and are not loaded with sugar! Quest Bar Nutrition was nice enough to send me a sampler box to test out these bars and spread the word. Quest bars are gluten-free and have 20 g of protein, 4 g of active carbs and no sugar added.The original line uses sucralose while the natural line uses stevia as a sweetener They have no soy protein, no glycerine, no added junk in them. While eating something clean such as a piece of fruit is maybe a more ideal snack, sometimes you need something that you keep with you when you're on the go and still satisfies a snack craving! So far I've tried the chocolate brownie, strawberry cheesecake, cinnamon roll, chocolate peanut butter, and coconut cashew flavors. I love having a bar in my bag for a late afternoon snack or when I'm on the go. I found that Quest Bars do have that nougat texture to them. It's recommended to microwave them for 30 seconds, and I've found that makes them a lot more delicious and appealing to me. The first time I tried the chocolate brownie flavor without microwaving it I thought it was kind of tough and chewy. My favorite flavor was the cinnamon roll, especially when I heated it up in the microwave. It would be delicious crumble on top of some froyo or greek yogurt! I also love when I look at the nutrition label that it's concise and understandable. Since I've been trying to eat clean, I look for the least amount of ingredients possible if buying non-fresh foods. I definitely recommend trying these bars! The taste is pretty great for the amount of ingredients they have. They are a little pricey, so it's probably cheaper to buy a box online or get them when GNC is having a buy 2, get 1 free protein bar sale. I know you can purchase them at GNC stores, iHerb.com, and from the Quest Protein website. Let me know what your favorite protein bars are! Whew. Last week I was still in a funk after the holidays. My sleep is off, and I'm trying to set a new routine for the gym where I go mostly in the mornings so I can take a class in the evenings if I want, but there is no pressure. Right now I leave work, take the bus home, eat a snack, workout, cook dinner with the boyfriend, and then sit down to relax and watch some Netflix and it's practically 10 PM (aka when I should be going to bed soon). It's stressful so I'm ready to try to change that-tomorrow (today was a sleepy morning!). Last night for dinner I was tired so I remembered something I found on Pinterest and it turned out to be so fabulous. Coconut Oil Roasted brussel sprouts with cashews and raisins. You MUST try this recipe. I had mine with sauteed balsamic tempeh and the boyfriend had his with some beef. I ate the leftovers for lunch and it was just as delicious. I want to add dried cranberries instead of raisins the next time I make it. It was a nice way to switch up my usual roasted brussel sprouts with just EVOO and salt and pepper! I'm also loving right now the book It Starts with Food. It's been all over the interwebs and healthy living blogs, twitters, etc. so I picked it up. I tried (did not finish!) a Whole30 a month ago and it taught me that my IBS problems are linked to gluten/wheat in some sense, so I've cut back on them but am not truly paleo since I still enjoy some red wine and greek yogurt! I don't think full paleo is right for me but it's nice to read the book and learn some science behind food and diet (yes, I'm a science nerd). It's really easy to read and understand so far -I'll let you know how the rest is when I finish it! I love how the luggage is super funky and would be so easy to spot at luggage claim! After he told me about the sale we went back and got him the men's sweater, the thermos, the serving tray, hipster cookie cutters, and then Proenza Schouler sweatshirt I've been sporting. 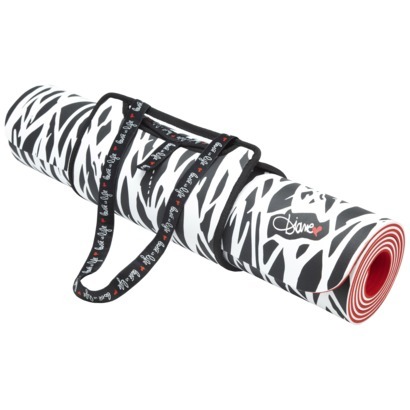 What I'm most excited about using is also the Diane von Furstenberg yoga mat. 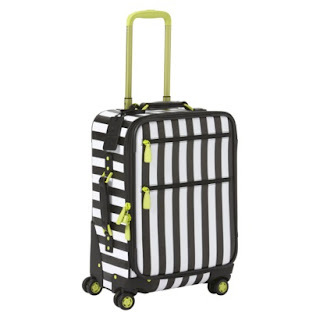 It's pretty thick foam and has a super cute matching carrying case. A new stylish mat is just the thing to get me started doing yoga regularly again I think! Check out the sale before it's all gone! Lastly, after doing Round 3 of Tina's Best Body Bootcamp I decided to sign up for Round 4. It'll be a great way to start the new year before I get into a heavy running routine prior to spring races! I'll let you know how it goes soon. Since it's the start of a new year, I'll be reflecting on the past year and looking forward to all that 2013 has in store in a couple of posts. First I'll talk about my biggest fitness (and life for that matter) accomplishments of 2012! It's when I knew I was a runner, even though I'm still shy to call myself that! 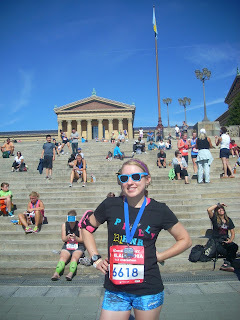 My biggest fitness accomplishment of 2012 is when I ran my first half marathon this past September at the Philly Rock and Roll Half Marathon. It was my “aha” moment of running. I have the common story of being an athlete in high school but then gained the freshman fifteen due to lack of exercise, poor food choices, and alcohol. Summer of 2011 I decided to get on a treadmill to get back in shape, but was stunned to find I could barely run a mile. I signed up for a local 5K in October to keep myself motivated, and after that first race, I fell in love with running. However even though I got involved with it as a hobby with my gear and running 4x a week, I never thought of myself as a runner because I thought I wasn’t good enough or wasn't winning races. For my first half marathon my only goal was to finish in under 2 hours. Even though I had run the cherry blossom 10 miler earlier that year faster than I thought I would, I still was scared about running the longest distance I had ever run. I had only trained up to 11.5 miles up to the point of race day. I made a shirt that said “I’m the fast girl your mother warned you about” (my new unofficial slogan now) and was so excited when the weather was great. 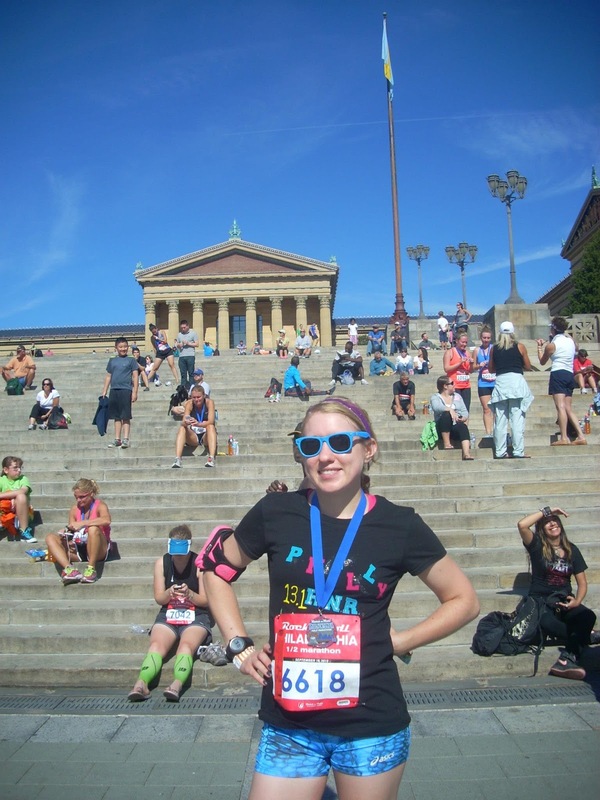 I was so nervous and around mile 8 my legs started to feel it but I pushed it out and felt on top of the world when I crossed the finish line in front of the Philadelphia Art Museum in 1:48:24! I was so elated afterwards and downed about 3 water bottles and some snacks when I finally met up with my boyfriend. He was so excited I met my sub-2 goal (not that he doubted me!). He was hugging me and telling me how proud he was of me when I started crying instantly. This fit of sobbing just came on out of nowhere. I don’t know what triggered it but can assume it was an emotional release of happiness, stress, and pride. At this moment it hit me how important running was in my life, and that I was indeed, a runner. I wasn't the fastest runner, but I was emotionally invested and dedicated. I enjoyed the struggles and the runner’s highs. What standards or qualifications had I been holding myself to that would deem me truly a runner? Game on, 2013.